HTC is prepping to unveil a few new devices in the next couple weeks. We’ll be live from the event on the 19th, but the expectations are that they’ll announce a few new Windows Phone 8 devices, plus possibly a follow-up to their Android-powered Flyer tablet. Heavily leaked online, the HTC “Accord” will probably go by the final name of the “Windows Phone 8X HTC.” The specs surfaced online, via the “Football” Twitter account – this is the same person who was bang-on about Nokia’s Lumia 820 and 920 devices. According to the leaked specs, the Windows Phone 8X will come with a 1.2GHz dual-core processor, 4.3-inch display, 8MP camera that shoots 1080p HD videos, 3.5mm headphone jack, Wi-Fi, 16GB internal storage, 1GB RAM, and come with Beats Audio. There’s no word on price or availability, but that will come clearer on September 19th. 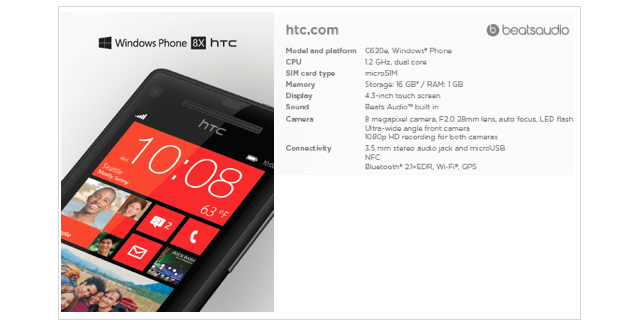 HTC is also expected to announce their flagship WP8 Zenith, and another mid-range device called the Rio.